The Clun Forest is a breed of domestic sheep originating from the area surrounding the Clun Forest in Shropshire. Similar to many of the British breeds of upland sheep, Clun Forest are hardy, adaptable, good foragers, and are long–lived. 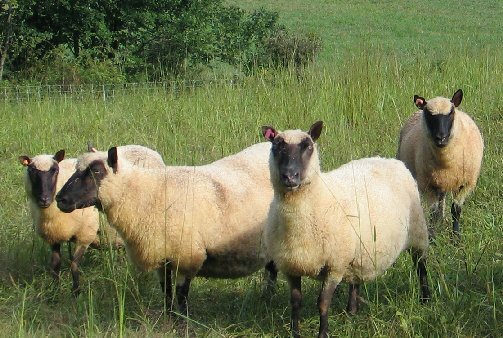 With sleek heads and wide pelvic structures, Clun Forest ewes lamb easily. The breed has a short to medium–length wool and dark brown faces. They are a multi–purpose animal, kept for meat, wool, and milk. Like other dark faced sheep, Clun produce quality lamb and mutton. However, in contrast to more common meat breeds such as Suffolks, their wool is free of undesirable black fibres and kemp, and is suitable for handspinning. The breed's alert and stylish appearance, together with its reputation for hardiness and fecundity have made it popular with hobby farmers and large commercial flock owners alike. The breed takes its name from ancient market town of Clun, situated in the beautiful Clun Valley in the south-west corner of Shropshire and near the county of Powys. The Clun Forest is a mountainous district, running to an altitude of 1,630 feet above sea level. It is a natural sheep walk with signs of "Pounds" and "Druid Circles" still remaining. Offa's Dyke runs through the lower part of the Clun Forest. It has been suggested that the original Clun sheep were bred by the pastoral or semi-nomadic shepherds who lived in the Forest about a thousand years ago. As far back as 1837 reference was made to the many excellent qualities of the Clun. The virtues of hardiness and fertility were the products of natural selection and sheep-lore based on the geological structure of the area. In 1892 W. J. Malden wrote, "In Clun Forest sheep there appear to be all the essentials necessary to produce a breed which cannot fail to add to the renown of a County which already occupies a leading place in the annuls of sheep breeding." Many Clun flocks are maintained at altitudes of 1,000 to 1,500 feet above sea level, whilst others thrive on rich lowlands. The British climate and geographic conditions are so varied that the Clun scores all along the line because of its adaptability and hardiness, whilst its prolificacy and ease of management account for the great demand of the breed for various systems of management and fat lamb production. The contented nature of the breed is a valuable asset, for the Clun is a good forager and will range over large pastures without attention. It is at home on the hills or moorlands and will fend for itself like a mountain breed. The Clun Forest Sheep Breeders Society was founded in 1925 with the object to 'secure in the future, absolute purity of lineage and fixity of type, also to get this grand breed of sheep still more widely known and recognised among the leading breeds of the United Kingdom.' This was stated in the first Flock Book, published in the year 1925. A Flock Book has been published every year since.